Notes: The Type 15 shuttlepod was introduced as a smaller and lighter counterpart to the Type 6 shuttle. Like the Type 6, it had modern materials and systems but unlike the Type 6 it also had an original hull design. 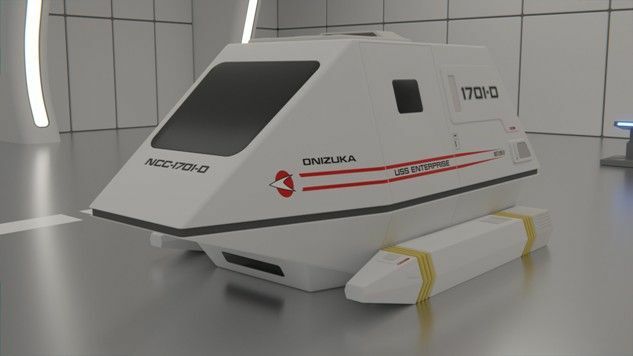 Starfleet had worried about bringing in too many new ideas with the Type 6, but with the lower level of resources involved in producing the much smaller Type 15, Starfleet decided to chance a completely new design. In order to reduce the risk of failure to a minimum the requirement called for a very simple design, consisting almost wholly of flat surfaces joined by molecular welding. This gives quite poor aerodynamic qualities, but the Type 15 is capable of sustained flight within an estimated 80% of all Class M planetary atmospheres. The Type 15 is capable of conducting almost any mission its larger siblings can, including interplanetary missions. The limiting factor in terms of range is considered to be crew comfort - with the crew confined to a single seat for the entire mission, uninterrupted mission duration above 12 hours are avoided if at all possible, while the Type 15 is not considered suitable for missions of greater than 26 hours except in emergencies. The Type 15 is now being moved out of front line service by the Type 18. These days it is mostly to be seen in the hangar bays of older Starships or Starbases.